Aqui Saddle Bar offers a full bar, an extensive selection of sipping tequilas and a large list of inspired margaritas, including our Industrial Strength Swirls™, Industrial Rocks, Craft Cocktails, Oliver Rocks and Classico Rocks. Pay very special attention to our fruit swirls and margaritas, Craft Cocktail Swirls, our hand crafted on the rocks specialties including our award winning Carlitos Cadillac – named after our very own Carlos Tovar. Of course, we offer a full lineup of cocktails from the Habana Mojito to the Classic Martini. Our Cupertino location is now our Industrial Swirl Counter. Please check out our Industrial Swirl Counter at Cupertino page. You’ll see list of our Industrial Swirls and Industrial Rocks. 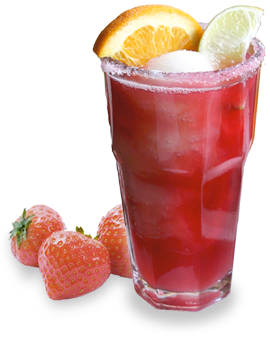 Aqui Saddle Bar – Serving the perfect Industrial Strength Margarita™ and inspired hand made drinks. When Aqui first opened in 1994, our neighbor was a wonderful man named Oliver. He ran his family business next door, which was a leather goods and saddle shop named “Oliver’s”. After several years, Oliver decided he wanted to move closer to horse country. He sauntered over to Aqui one day for lunch, in his classic Western gentlemanly way, and said, “How ’bout Aqui taking our space next door.” Of course, we jumped at the opportunity and said yes. Inspired by the Oliver family business that served the community for fifty years, and to honor Oliver’s consideration in offering us his space, we built our first Saddle Bar. When in our Saddle Bars, you cannot help but notice the influence of Oliver’s legacy. You will see hand made sconces, copper and steel shelving and big stools covered in leather hides inspired by the West and Oliver’s love for horses and fine craftsmanship. Thank you, Oliver, for trusting us to continue serving the community.